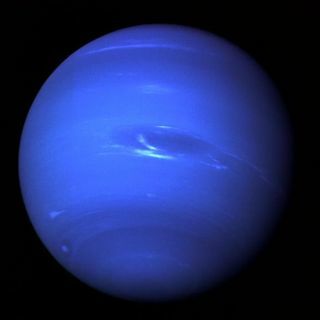 Composition: The overall composition of Neptune is, by mass, thought to be about 25 percent rock, 60 to 70 percent ice, and 5 to 15 percent hydrogen and helium, according to Tristan Guillot, author of "Interiors of Giant Planets Inside and Outside the Solar System" in the journal Science. Triton is the only spherical moon of Neptune — the planet's other 13 moons are irregularly shaped. It is also unique in being the only large moon in the solar system to circle its planet in a direction opposite to its planet's rotation — this "retrograde orbit" suggests that Triton may once have been a dwarf planet that Neptune captured rather than forming in place, according to NASA. Neptune's gravity is dragging Triton closer to the planet, meaning that millions of years from now, Triton will come close enough for gravitational forces to rip it apart.